A recent oil spill in the North Sea has officials and activists in Alaska and Scotland concerned about Shell's upcoming experimental wells in the Beaufort Sea. About 1, 300 barrels of oil has leaked from the Gannet Alpha platform into the North Sea 110 miles east of the coast of Aberdeen, Scotland. In response, Shell has laid five concrete "blankets" on the stretch of pipeline that lifted four feet off the sea floor, causing the leak. Divers are in the midst of making a risk assessment so they can safely shut it off. At this stage, the platform has not been shut down and the company has offered no timeframe for doing so. Glen Cayley, Shell's director of exploration and production activities in Europe, says the company is "making good progress" on stopping the remaining leak. "Shell claims it can clean up 90 percent of spilled oil in the Arctic, but past experience shows this figure is wildly inflated," said Rebecca Noblin, Alaska director of the Center for Biological Diversity in a statement on Tuesday. "Only 8 percent to 9 percent of the oil was recovered after the Exxon Valdez spill, and about 3 percent was recovered after the Deepwater Horizon disaster." Richard Lochhead, the Scottish Environment Secretary, says the damage to the fishery is expected to be minimal and only one oiled bird has been found so far. However, the Royal Society for the Protection of Birds says puffins, razorbills and guillemots on the open water could still be at risk. 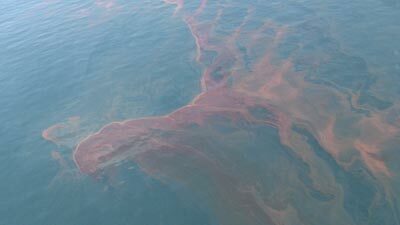 While it doesn?t appear that this event will be on par with the devastation caused last summer by the BP oil spill in the Gulf Of Mexico, the slow response by Shell and the company?s reluctance to share details is causing some alarm. "Shell?s oil spill and lackluster response in the North Sea is deeply troubling, especially because the company plans to drill up to 10 new wells in the Arctic, where a spill would be impossible to clean up," said Nobin. "The Obama administration should take this lesson to heart and deny Shell?s permits to drill in Alaska." "It really does make you question the entire oil industries' ability to respond had this accident been on a larger scale or in the much more difficult waters of the Arctic" said Dr Richard Dixon, Director of WWF Scotland.